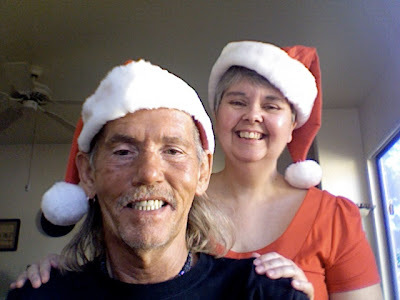 Lesa's Book Critiques: Merry Christmas! Jim and I wish you a Merry Christmas. We hope your Christmas is filled with love, and time spent with your loved ones, your pets, and, of course, books. From our house to yours, Merry Christmas! Thank you Lesa for sharing .WIsh you all a Happy Merry Christmas today. Thank you, Avagdro. And, Merry Christmas to you and your family. You two are so cute! Merry Christmas! Thank you and Merry Christmas to you and Jim!!! Thank you, Bermudaonion. Merry Christmas to you as well! Thank you, Mash1195. Merry Christmas to you and your family! That picture is great -- made me smile! Merry Christmas to you, Jim, and the kitties. Great picture. Same to you guys :-). Beth, I'm always happy to make you smile. Wait until you see me in the sweatshirt Jim gave me. It says, "Don't Make Me Use My Librarian Voice!" Thank you, le0pard13. I hope you have a wonderful Christmas with your family. Great picture Lesa! Have a wonderful Christmas with your family! Thank you, Bonnie. Merry Christmas! What a happy picture! Merry Christmas to you, Jim and the kitties! Thank you, Ingrid. And, Merry Christmas to everyone in your household, family, friends, and furbabies! Hope your holiday was special Lesa. Thank you, Diane. It was a very special holiday. I hope you enjoyed all of yours. Hope you're having a wonderful holiday, Lesa. Thanks for the little video clip. I *did* love it! I'm having a very nice holiday, Cathy. I hope you are, too. I thought you'd enjoy it!